Steel guitar is a type of guitar or the method of playing the instrument. Developed in Hawaii by Joseph Kekuku in the late 19th and early 20th centuries, a steel guitar is usually positioned horizontally; strings are plucked with one hand, while the other hand changes the pitch of one or more strings with the use of a bar or slide called a steel (generally made of metal, but also of glass or other materials). 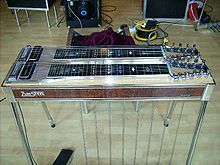 The earliest use of an electrified steel guitar was first made in the early 1930s by Bob Dunn of Milton Brown and His Brownies, a western swing band from Fort Worth, Texas; the instrument was perfected in the mid to late 1930s by Fort Worth's Leon McAuliffe, who played for western swing band Bob Wills and His Texas Playboys. Nashville later picked up the use of the steel guitar in the early days of the late 1940s and early 1950s "Honky Tonk" country & western music with a number of fine steel guitarists backing names like Hank Williams, Lefty Frizzell and Webb Pierce. The term steel guitar is often mistakenly used to describe any metal body resophonic guitar. The slide technique of playing slide guitar is generally by using a steel bar. Resonator guitars, including round necked varieties, are particularly suitable for this style, yet are seldom referred to as "steel guitars", but rather referred to generally as a Dobro, acoustic slide guitar, or square neck resonator guitars. Dobro is also a brand name of one of the leading manufacturers of resonator guitars. Lap slide guitar, with a conventional wooden guitar box. The square-necked variety of resonator guitar. Steel guitar refers to a method of playing on a guitar held horizontally, with the treble strings uppermost and the bass strings towards the player, and using a type of slide called a steel above the fingerboard rather than fretting the strings with the fingers. This may be done with any guitar, but is most common on instruments designed and produced for this style of play, typically with painted lines instead of frets, since the strings are much too high to be fretted. Playing a steel guitar with a steel can be quite challenging, and great (non-pedal) steel players are few and far between, because of some of the techniques involved such as slanting the bar, palm damping, thumb damping, and unique styles of picking are not easily mastered. The technique was invented and popularized in Hawaii. Thus, the lap steel guitar is sometimes known as the Hawaiian guitar, particularly in documents from the early 20th century, and today any steel guitar is frequently called a Hawaiian steel guitar. However, Hawaiian guitar often refers to slack key guitar, played in the conventional or Spanish position, using a conventional fretted guitar in various open tunings, generally with the strings tuned considerably lower than usual. Steel guitar tunings tend to feature close intervals (2nds and 3rds) whereas slack key tunings more often contain 4ths and 5ths. Dobro is a brand of resonator guitars, but the word is most often used to describe bluegrass instruments of several different brands. Tunings and techniques are similar to acoustic Hawaiian steel guitar playing, but have evolved somewhat differently in the bluegrass idiom, which generally involves faster picking and changes than Hawaiian music does. Bottleneck guitar may have actually developed from Steel guitar technique. It is similar, with the exception that the guitar is held in the conventional position, and a different, tubular form of slide is slipped over the middle or ring finger or pinky to accommodate this playing position. The slide is almost never slanted. Common bottleneck tunings are open D and E chords. A steel guitar is one designed to be played in steel-guitar fashion. Resonator guitars, particularly the square-necked variety which can be played only in steel guitar fashion. Electric instruments, starting with electric lap steel guitars and developing through the console steel guitar to the pedal steel guitar. Soldier's Joy, North Carolina Hawaiians, 1929. The lap steel guitar typically has 6 strings (and sometimes 8) and may have various tunings. Originally the 'standard' EBGDAE tuning was changed to allow 'open' i.e. major chord tunings to accommodate using the straight steel bar and not require changing string gauges. Currently a new generation of musicians use open tunings (e.g. Open D), but typically, Hawaiian music for virtually the last 100 years has used more complex tunings once musicians could manipulate bars to execute diagonal barrings, both forward and back. Hawaiian tunings evolved from A Major and E Major to E7, C sharp Minor, C sharp Minor 9th, F sharp Minor 9th, B11th and the popular E 13th. Jerry Byrd is credibly the originator of the C6+A7 tuning ECAGEC sharp(CA) which allows a wider ranging of chording for Hawaiian and many other forms of modern music. (Reference Needed) It differs from a conventional or Spanish guitar in having a higher action and often a neck that is square in cross section. The frets, unused in steel style playing, may be replaced by markers. Lap slide guitars, which are acoustic instruments but may have electric pickups for amplification in addition. Resonator guitars, which are also acoustic instruments but may have pickups for amplification in addition. Electric lap steel guitars, which are normally solid body. Early lap steel guitars were Spanish guitars modified by raising both the bridge and head nut. The string height at the head nut was raised to about half an inch by using a head nut converter or converter nut. This type of guitar is claimed to have been invented in about 1889 by Joseph Kekuku in Hawaii. Some lap slide guitars, particularly those of Weissenborn and their imitators, have two 6-string necks, but electric and resonator lap steel guitars are normally single neck instruments. Square-necked resonator guitars are always played in lap steel fashion, and so are specialized lap steel guitars. Round-necked varieties can be played in lap steel fashion, with some restrictions on the available tunings, but can also be played in Spanish position. The Rickenbacker frying pan, an electric lap steel guitar produced from 1931 to 1939, was the first commercially successful solid body electric guitar. The console steel guitar is an electric instrument, intermediate between the lap steel from which it developed and the pedal steel which in turn developed from the console steel. There are no pedals, so the player has only as many tunings available as there are necks. The development of the lap steel guitar into the console steel guitar saw the introduction of amplification as standard, multiple necks, and additional strings on each neck, first to seven, and eight strings per neck is now common. One, two, three and four neck instruments are not uncommon. The two neck, eight string per neck configuration is particularly favored in Hawaiian music. The distinction between console steel guitar and lap steel guitar is fuzzy at best, and some makers and authorities do not use the term console steel guitar at all, but refer to any steel guitar without pedals as a lap steel guitar even if playing it in lap steel position would be quite impossible. The pedal steel guitar is an electric instrument normally with 8 to 14 strings per neck, and one or two necks, each in a different tuning. Up to ten pedals (not counting the volume pedal) and up to eight knee-levers are used to alter the tunings of different strings, which gives the instrument its distinctive voice, most often heard in country music. The extra strings and use of pedals gives even a single neck pedal steel guitar far more versatility than any table steel guitar, but at the same time makes playing far more complex. The type of slide, called a steel, which gives the technique its name, was probably originally made of steel. There is a legend that the first steel was a railroad track. Many materials are used, but nickel-plated brass is popular for the highest-quality slides, which are shaped to fit the hand and as a result have a cross-section not unlike a railroad track. Another traditional and popular shape is a cylindrical-shaped steel bar balanced between the thumb and the middle finger. The forefinger provides varying degrees of pressure on the string. The cylindrical bar is most often used with the pedal-steel guitar. The term "steel guitar" should not be confused with "steel-string guitar", which is a standard acoustic guitar that has steel rather than the nylon, catgut or brass/nickel strings used for classical guitar, and is built with extra bracing, a stronger neck, and higher-geared machine heads to compensate for the much higher tension of steel strings. The steel guitar takes its name from the type of slide used, not from the material of the strings. Also, the term "steel guitar" does not describe what the guitar itself is made out of. Acoustic steel guitars used in Hawaiian music are made out of wood, and some resonator guitars are made out of steel or brass but aren't steel guitars due to the manner in which they are played. The term "Hawaiian guitar" is often used for various types of steel guitar, but in Hawaiian music Hawaiian guitar means slack-key guitar, a way of tuning a steel stringed acoustic guitar which is then played in the conventional position.